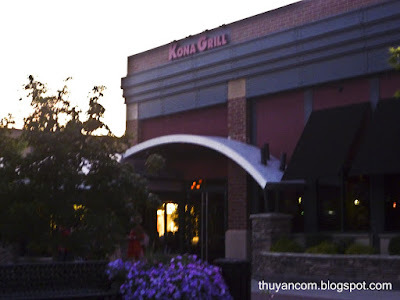 Kona Grill is the first restaurant I tried in Indianapolis, way back in high school. I was visiting a friend who loves sushi and Kona happen to be one of his favorite. Even though it was years ago I still remember my unforgettable experience, seared swordfish that was oh so moist! Now that I live here, I occasionally go to Kona for their happy hour specials and sushi. On my most recent visit I decided to try something off the dinner menu, something i rarely do anymore. It was a satisfying meal for me but a bumpy ride for my friends. Kona is located at Clay Terrace outside mall in Carmel. It offers American cuisine with an edge, exciting Asian fusion, fresh seafood, and award-winning sushi. The ambience is very chic. You have the option of sitting in the dining area, patio, or at the bar. I highly recommend the bar area because you have front row seats to the gigantic fish tank filled with exotic fish. The prices can get expensive depending one what you order, especially steaks and seafood. Don't worry you are not just paying for the service and atmosphere, the food is actually really good. We went during the happy hour special so we just couldn't pass up the $5 calamari. 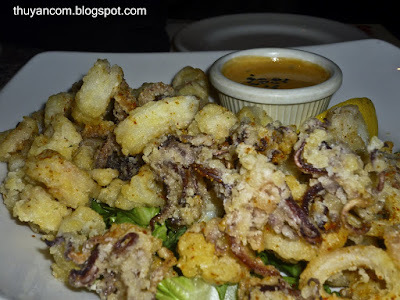 The calamari is fried in a light batter and serve with a spicy mayo sauce. It is crispy on the outside yet still tender on the inside. I order the calamari on every visit and it just doesn't get old! Next up is the happy hour sushi roll for just $3. You can choose rolls with crab, shrimp, salmon, tuna, or some vegetarian option. 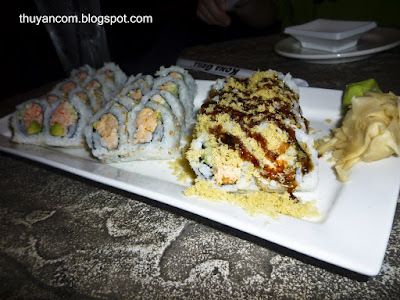 The happy hour sushi are tasty for the money but I much prefer the sushi off the regular menu. I like big rolls filled with all sort of seafood that you can barely get into your mouth. 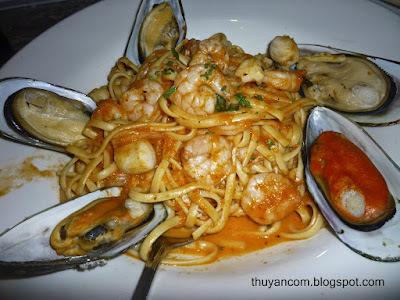 For the main course, I ordered the fresh seafood linguine with mussel, scallop, and shrimp. The linguine is toss in a creamy tomato sauce, very subtle in flavor but in a good way. The mussels were grilled separately and added to the pasta before serving. I'm usually not a fan of mussels but the sweetness made them my favorite part of the meal. I expected a lot of pasta and a few shrimp here and there but as you can see you get plenty. My friends shared the pork tenderloin topped with a shitake mushroom sauce. It also came with a nice helping of white cheddar mashed potatoes and sauteed baby bok choy. Unfortunately, the baby bok choy was the best thing about the dish. 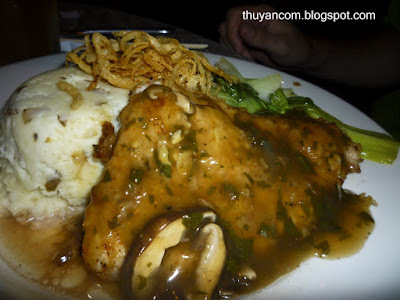 The tenderloin was drenched in the mushroom sauce which is such a turn off because it really take away the natural flavor of the meat. After trying a bite I was a bit glad for the sauce because the pork was dry and bland. I guess we came on a bad night for the pork tenderloins because my friends have had them before and loved it. The pork tenderloin certainly did not scare me away. I have had so many good experiences at Kona that I will return for more. If you are ever in the north side, give Kona a try or at least come for the happy hour. Happy hour specials include appetizers, sushi, pizzas, and drink specials. Check website for for hours. the spaghetti with seafood makes me so hungry!! !